All the details about the latest Pixelmator Pro updates. 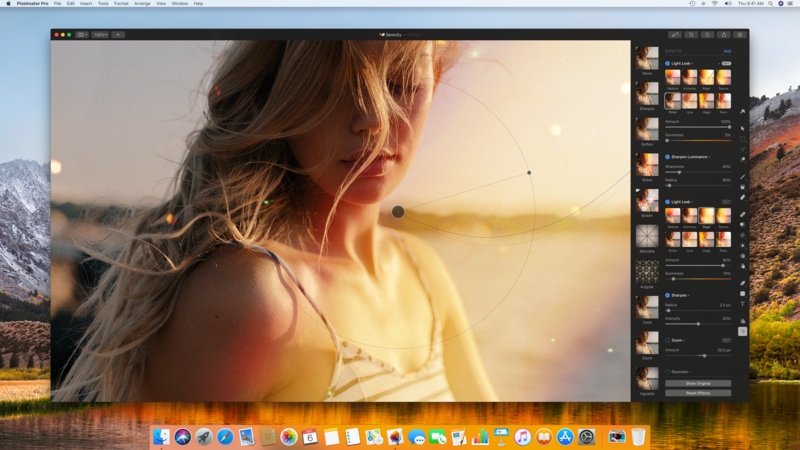 Pixelmator Pro 1.3.3 includes a few small fixes to keep Pixelmator Pro running smoothly. Thanks to Portrait Mask support, Pixelmator Pro will now open photos taken in Portrait mode on iOS 12 together with a layer mask. Pixelmator Pro will now always use tabs by default and remember your window size and position for all new documents. Use the new Comics effect to quickly apply a comic book-style to any image — you can find this effect in the Stylize category. A number of new keyboard shortcuts make it easier to select, organize, and duplicate layers. Press the Slash (/) key to quickly lock and unlock layers. Option-Left bracket ([) and Option-Right bracket (]) let you select one layer up and down. Option-Comma (,) and Option-Period (.) let you select the top and bottom layer. Option-Arrow will now duplicate layers and move them by 1 pixel. Option-Shift-Arrow will duplicate and move by 10 pixels. Option-clicking a layer’s visibility icon will now hide all other layers. Zoom performance improvements speed up zooming in documents with many layers. Pressing the Return key while drawing a path will now close the path. Converting text to shape is now much (much) faster. The Repair tool progress bar will no longer be shown when making quick, small repairs. The Brightness adjustment is now more precise in images with extreme tonal ranges. Previously, the Channel Mixer used our perceptual color model to make prettier adjustments. Since it’s more of a functional adjustment rather than a creative one, it now mixes channels purely mathematically. Changing the rulers’ origin will now update the grid to match the new rulers. Pressing and holding the Shift key while changing the rulers’ origin will now snap it to the grid and objects in your composition. When you add a new, untagged layer to a tagged group, it will be assigned the group’s color tag. Attempting to use the Color Fill or Gradient Fill tools on text or shape layers will now create an empty new layer and fill that instead of doing nothing at all. Added an Add Guide command to the View menu’s Guides submenu. Whenever possible, Pixelmator Pro will try to preserve the font face when changing font family. Improved compatibility with certain kinds of text layers in Photoshop documents. The orientation of masks in Portrait images exported from the Photos app would be incorrect. Fixed. Using the arrows in the Arrange tool, it was sometimes possible to resize layers to an invalid size. Fixed. Attempting to add effects to extremely tall and narrow layers would occasionally cause Pixelmator Pro to quit unexpectedly. Fixed. 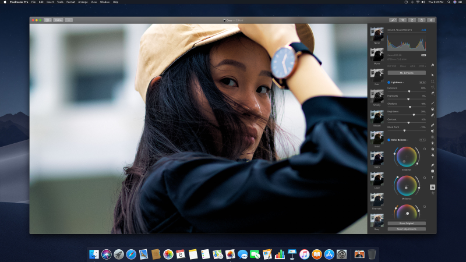 Pixelmator Pro 1.3.2 includes a fix for an issue that caused the Photo Browser to be empty when using a newly installed version of Pixelmator Pro on macOS Mojave. Pixelmator Pro now opens any photos taken in Portrait mode together with a handy layer mask. Tabs are awesome so Pixelmator Pro will now use tabs by default. Several additional keyboard shortcuts make it easier to select, organize, and duplicate layers. 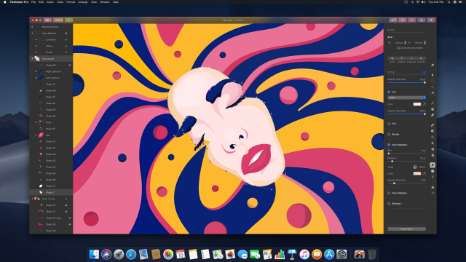 Pixelmator Pro was performing slowly in the latest version of macOS on certain 2016, 2017, and 2018 Mac computers. This version includes a workaround with a fix. Due to new font smoothing introduced in macOS 10.14, fonts were thicker on 10.14 than 10.13. Fixed. When dragging & dropping text presets, the preview was incorrect. Fixed. Holding the Z key to choose the Zoom tool would make Pixelmator Pro beep inappropriately. It’s now much better behaved. Layers would incorrectly snap to grids based on non-pixel units. Fixed. New documents created from text or shape layers in the clipboard would not be correctly aligned to the canvas. Fixed. After dragging to rearrange parts of text within a text layer, changes would be undone incorrectly. Fixed. Pixelmator Pro workflows in the Automator app were not working correctly when RAW files would be automatically converted to Pixelmator Pro format using the Auto Enhance action. Fixed. The colors in the Color Picker preview did not correctly match the document’s colors. Fixed. When changing font family, the previous font’s name would sometimes briefly flicker in the menu. Fixed. On macOS Mojave, tab titles would sometimes overlap. Fixed. On macOS High Sierra, text in the About window was the wrong color. Fixed. Organize your layers by giving them handy color tags. With filtering and searching, finding just the layers you're looking for is easier than ever. Clipping masks let you effortlessly clip the contents of one layer to the shape of another — even layer groups and nested shapes! You can now change a layer's opacity settings and blending mode right in the Layers sidebar. With layer filtering and search, finding just the layers you’re looking for is simpler than ever. Filter layers according to layer type (images, text, shapes, and groups), color tags, or both. Quickly adjust layer opacity and blending mode right in the Layers sidebar. Use clipping masks to clip the contents of one layer to the outline of another — even layer groups or nested shapes! Add clipping masks from the shortcut menu in the Layers sidebar, by Option-clicking between two layers, or from the Format menu. Release a clipping mask by double-clicking the arrow in the Layers sidebar. When using the painting, retouching, or reshaping tools on a layer with Color Adjustments, Effects, or Styles, all nondestructive filters will dynamically update to the layer’s new content and won’t be flattened. This one’s big! It’s now possible to apply Color Adjustments to shape layers. When opening Photoshop documents with color tags, they will now be both opened and saved. Convert into Pixels is now a fully-fledged rasterize button and will rasterize any layer, including image layers with adjustments, effects, layer styles, and transformations. The Refine Selection command has been added to the Edit menu. When converting hidden layers into pixels, they will no longer be rasterized into empty layers. Double-clicking any shape — including Smart Shapes — will now make it editable. Exporting documents with layer styles in effects in Photoshop format has been much improved. Fixed several blur issues with converting certain kinds of layers (groups and shapes with effects) into pixels. Copying and pasting selected content would sometimes result in blurring. Fixed. On rare occasions, resizing the crop box while holding the Command key would blur the image or leave 1 pixel-wide lines at its edges. Fixed. Documents containing many layers with lots of nondestructive styles and effects would sometimes have unwanted vertical and horizontal artifacts. Fixed. The state of the Sample All Layers option would not be remembered when using the Color Fill and Magic Eraser tool. Fixed. Fixed an issue with using percentages to set grid spacing. Fixed an issue with using drag & drop to rearrange paths in shapes made up of only two paths. Several crash fixes improve the stability of Pixelmator Pro. The Color Balance adjustment has a brand new design, inspired by professional color grading tools. When using the Image Size command, you can now choose from three image resizing algorithms — Bilinear, Lanczos, and Nearest Neighbor. This update also brings two new Pixelmator Pro actions for the Automator app — Scale Images and Trim Images. The Color Balance adjustment has been redesigned and can now be edited using color wheels inspired by those used in the cinema industry to color grade films. Along with adjusting the color tints of the shadows, midtones, and highlights, the new Color Balance now includes sliders for adjusting their brightness and saturation as well. A Master wheel lets you adjust the Color Balance of an entire image at once. Color Balance can also be improved automatically using the ML Fix feature, trained on millions of professional photos. Bilinear is the standard resizing algorithm, good for most uses. Lanczos can preserve small details better when upscaling and downscaling. Nearest Neighbor is a popular resizing algorithm for pixel art as it creates​ a blocky look with sharp edges. The Grain adjustment has been improved to apply photographic grain more naturally, especially when an image has small details and large grain particles. Use two new Automator actions — Scale Images and Trim Images — to batch resize images and batch delete transparent or solid colored areas from the edges of images. The last used document size now appears as an option in the template chooser. The currently active tool will be marked with a checkmark in the Tools menu. Dragging a layer from the Layers sidebar onto the export preview without having created any slices will now create a new slice. ML Enhance will now be unhighlighted if an adjustment is removed. The look of the Curves adjustment has been improved in macOS Mojave. All edited curves will now be visible when editing all channels, not just RGB. The Trim Canvas command will now work better with thin images. Fixed a rare crashing issue with rasterizing text layers. Fixed various situations where effects ropes were not in sync with the image. The thumbnails of empty masks applied to empty layers would not be visible. Fixed. On rare occasions, closing a document would make Pixelmator Pro quit unexpectedly. Fixed. You can now import ABR (Photoshop) brushes to Pixelmator Pro. The performance of all the brush-based tools, such as the Paint tool, retouching tools, and reshaping tools, has been improved. A bigger brush size limit, better Quick Selection tool performance, and a range of stability fixes round off this update. The performance of the painting, retouching, and reshaping tools has been improved. The maximum brush size has been increased from 1000 to 2500 pixels. You can now invert the brush Shape and Grain textures by clicking the word Shape or Grain below the preview and choosing Invert. Improved preset importing experience: after importing a collection of brushes, the new collection will become active, after importing some custom shapes, the Shapes palette will become visible, after importing effect or adjustment presets, the Effects and Color Adjustments tools will become active. Brush previews will now be generated without slowing down the interface, which should speed up importing collections of large brushes. The selected brush preset is now more visible in Dark Mode. The performance of the Quick Selection tool on Mac computers with Intel GPUs has been improved. When opening images from Aperture, Pixelmator Pro will now attempt to save changes back to the original image. The Color Adjustments and Effects tools will now be opened more quickly. Added the ability to show the Change Type of Images, Apply Color Adjustments to Images, and Apply Effects to Images interfaces when running those workflows using Quick Actions or Applications. Hovering over a gradient color stop and color midpoint will now show its position. Adjusting character spacing while having the insertion point between two characters will now change the spacing between those two characters. The animation of the ML Enhance button has been improved. The look of the text selection background color in macOS Mojave has been improved. The thumbnails of small layers are now more accurate in the Layers sidebar and Presets bar. When selecting an empty layer while the Color Adjustments or Effects tool is active, thumbnails in the Touch Bar would not update correctly. Fixed. When a document is opened with a layer group selected, the Arrange tool will now be updated correctly. Fixed a number of graphical glitches that would appear while painting, such as vertical and horizontal lines, rendering issues, and parts of brushstrokes not appearing after until after the mouse was released. Fixed a memory leak with closing documents that have group layers. Improved handling of brush textures — the orientation of the brush texture previews will now be correct. Masked areas will now be preserved when exporting images using Export for Web with a non-1x scale. Undoing and redoing canvas size changes will no longer shift objects. SVG documents over 10MB would not be opened. Fixed. When painting quick brushstrokes, the ends of the stroke would sometimes be rendered incorrectly. Fixed. Fixed an issue that would make Pixelmator Pro quit unexpectedly when using certain selection tools. Using the Spacebar + Command key keyboard shortcut will no longer make Pixelmator Pro beep. Using the Reveal Canvas command would occasionally blur layers in certain situations. Fixed. The Crop and Slice buttons would not be highlighted in the toolbar when selected. Fixed. Fixed an issue that would cause Pixelmator Pro to quit unexpectedly if a document was immediately closed upon opening. Closing a document while zooming would occasionally cause Pixelmator Pro to quit unexpectedly. Fixed. Pixelmator Pro would sometimes quit unexpectedly when opening certain kinds of Photoshop documents. Fixed. 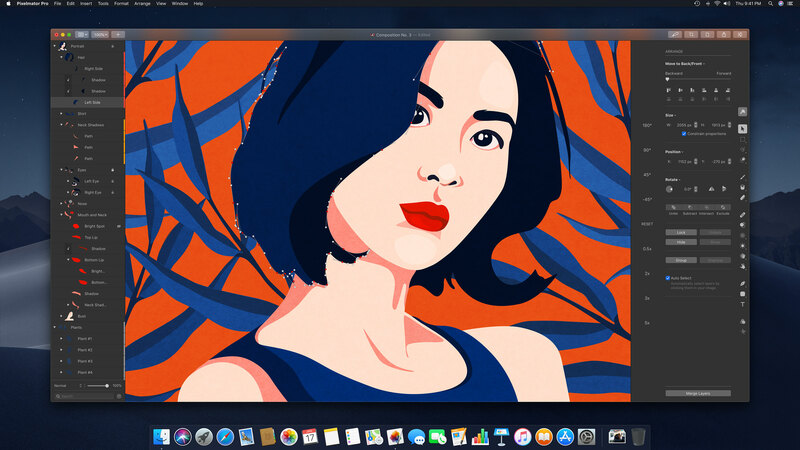 Pixelmator Pro 1.2.2 includes a fix for an issue that made it possible to purchase Pixelmator Pro on non-Metal devices, which are not supported. Pixelmator Pro 1.2.1 includes a few fixes for the new Automator actions. 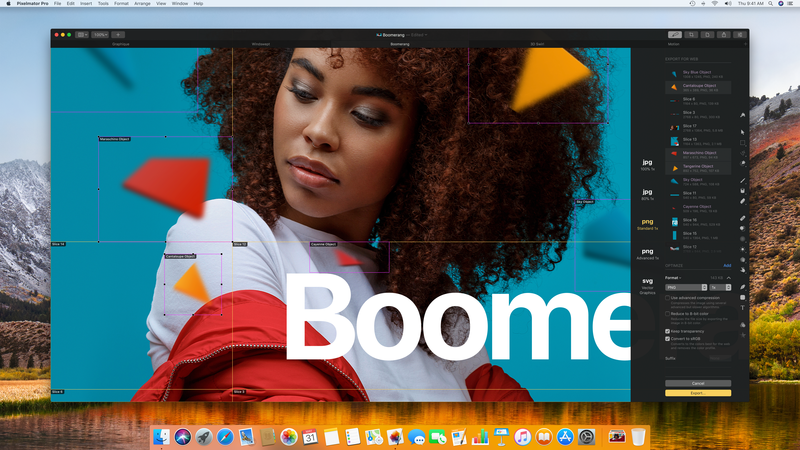 Pixelmator Pro 1.2 Quicksilver brings full support for macOS Mojave, including support for the Continuity Camera and colorful SVG Fonts. 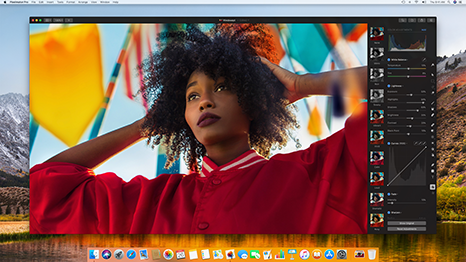 With an all-new light appearance, Pixelmator Pro adapts seamlessly to the light and dark modes in macOS Mojave. Instantly make every photo look its best using the new ML Enhance feature, powered by Core ML. Batch process images using five powerful Pixelmator Pro actions inside the Automator app. A gorgeous new light appearance lets you experience Pixelmator Pro in a whole new way — and you can change appearance any time in Pixelmator Pro preferences. After hiding and showing the Pixelmator Pro Tool Options pane, certain buttons would not be updated when using the Arrange tool. Fixed. You should now be able to select, move, and start editing layers in complex documents much more quickly. Large and complex documents should now be opened much faster — in some cases over 10 times faster. This update brings lots of other improvements, including extended ranges for a number of blur effects, improvements to adding and managing guides, and more. The performance of the Quick Selection tool has been improved by 20%. The cursor of the Paint, Erase, and Pixel Paint tools will now be displayed as a crosshair if it is smaller than 2 pt on the screen (based on your zoom level). All fonts will now be displayed in the Type tool’s font pop-up menu instead of just the ones optimized for your current locale. Guides can now be moved while using the Type and shape tools. There is now a Guides submenu in the View menu with options to clear and lock persistent guides as well as customize alignment guides. The range of the Spin, Box, Disc, and Motion blur effects has been extended — hold down the Option key and drag the Amount/Radius sliders to blur layers even more. When applying effects, such as False Color, Clouds, and Checkerboard, which fill areas with color, you can now adjust the opacity of each color (in the Colors window). The Invert color adjustment now inverts colors mathematically rather than perceptually, just like the Invert effect does. When using the Crop tool, the cropping box will now be drawn over your entire image, not the area on which you are currently zoomed in. When opening the Photo Browser, the Photos library would occasionally not load the first time. Fixed. Fixed an issue with hue-adjusting (Hue, Select Color, Color Balance) color adjustments applied to layer masks. Fixed an issue with using the Gradient Fill tool on layer masks with blending modes other than Normal. Fixed an issue with applying color adjustments on empty masks — after applying the Invert adjustment, for example, it would not be immediately rendered in the image. Resetting certain effects, such as Perspective Transform, Pinch, and others, would not redraw the entire image correctly. Fixed. Dragging and dropping layers with masks from one document into another would not preserve the position of the mask. Fixed. Fixed an issue with undoing an image size change after selecting and transforming part of an image layer. Undoing an image size change while being fully zoomed out would make it impossible to change the zoom level. Fixed. Undoing an image size change in documents with text would sometimes break the layout of the text. Fixed. When using the Crop tool in images containing areas beyond the canvas, those areas would not be displayed correctly. Fixed. Writing and deleting text with the Stroke layer style applied would temporarily leave parts of the deleted text in the image. Fixed. When performing many repeated actions in a row, thumbnails would not always update immediately. Fixed. Added a few fixes related to SVG rendering during import and export. Fixed an issue with using the Retouch and Paint tools in large documents that would sometimes cause Pixelmator Pro to quit unexpectedly. Fixed an issue with infinite memory allocation when applying effects to horizontal and vertical line shapes. Less memory will be used for the undo history of the paint, distort, and retouching tools. Opening the font family and font face pop-up menus in the Type tool would sometimes cause Pixelmator Pro to quit unexpectedly if certain system fonts were disabled. Fixed. Fixed an issue that would cause Pixelmator Pro to quit unexpectedly while closing a document. This update adds a whole bunch of new effects — a gorgeous Light Leak effect, stylish Bokeh, Spin blur, Noise, Clouds, and more. The Selective Color adjustment can now be applied automatically to improve individual colors in an image using machine learning. Change the histogram type when using the Color Adjustments tool by Control-clicking the histogram and choosing a new type. Quickly create vector shapes from selections in your images. Open images in a few more exotic formats, such as: EXR, PBM, ICNS, Radiance HDR, and texture formats like PVRTC, ASTC, and KTX. This update brings a few nice improvements like the ability to place guides at exact positions, Command-clicking layer thumbnails to load selections, RAW badges in the Pixelmator Pro Photo Browser, and more. You can now add alignment guides at exact locations by double-clicking a ruler or Control-clicking and choosing Add Guide. While browsing the Pixelmator Pro Photo Browser, RAW images in your Photos library will be marked with a RAW badge. The Pixelmator Pro Photo Browser now opens RAW images in the original RAW format by default. The New from Photos command in the File menu now has a keyboard shortcut — Option-Command-N.
Command-clicking the thumbnail of a layer or layer mask will now load the outline of the layer as a selection. Shift-clicking the thumbnail of a layer mask will toggle the mask’s visibility. The quality and speed of the Auto White Balance, Auto Hue & Saturation, and Auto Lightness adjustments has been improved. The Blur radius of the Shadow layer style was twice as large as it should be. Fixed. Duplicating a text layer with a layer mask would cause Pixelmator Pro to stop responding. Fixed. Fixed an issue that caused the eyedropper in the Colors window to pick colors slightly incorrectly. Opening Pixelmator Pro documents using the Open With command in Finder would both open the document and leave the Open dialog visible. Fixed. On rare occasions, Pixelmator Pro would quit unexpectedly when opening images. Fixed. Painting on a layer inside a layer group with effects applied to the layer group would cause Pixelmator Pro to quit unexpectedly. Fixed. Quitting Pixelmator Pro in the middle of applying an Auto Color Adjustment would cause the app to quit unexpectedly. Fixed. On rare occasions, brushes from the original Pixelmator would not be imported into Pixelmator Pro. Fixed. Pixelmator Pro 1.1.1 includes a number of Export for Web improvements as well as a range of additional fixes. You can now expand grouped tools by Force clicking the group or clicking and holding it for half a second. Export suffixes will now be saved with export presets. SVG images will be exported with more compact compression. Scrolling the font size field would create undo steps for each intermediate size. Now, undo steps will be created only for the sizes you stop on. After resetting the style of a shape, the next shape will be drawn with the default style. Performance when resizing layers with gradients fills or strokes has been improved. The progress bar will no longer be shown when using drag and drop to export one slice with one format if an optimized version has already been prepared. You can now scroll the size fields when using the Arrange tool with more precision. When creating a new document from a layer, the layer will be placed so that any layer styles appear inside the canvas. Object slices from text layers will now be created more accurately. When using the Slice tool, selecting an object slice will now select the associated layer in the Layers sidebar and vice versa. When exporting to SVG, shapes with center stroke outlines would be exported with square joints, instead of the round ones in Pixelmator Pro. Fixed. The brush cursor would not update when using a Retouch or Distort tool and changing the brush size in the Touch Bar. Fixed. When using the Color, Image, and Gradient fill effects, the selected blending mode would not have a checkmark next to it in the blending mode pop-up menu. Fixed. The brush cursor would flicker when selecting the Paint tool if the size of the brush was different from the size saved in the preset. Fixed. The effect handle position of the Focus and Tilt-Shift effects would not update after undoing. Fixed. When using Export for Web, adding a suffix, then changing the export format to SVG would export the SVG with a suffix, even though it shouldn’t have one. Fixed. If part of a text layer was beyond the canvas, converting it into pixels would sometimes change its position. Fixed. The Undo command would temporarily stop working while moving documents between Retina and non-Retina displays. Fixed. Fixed an issue with reopening documents that contain line text layers wider than the image canvas. When using Wacom graphics tablets to edit gradient color stops, it would be very difficult to change colors. Fixed. When creating documents in full screen, graphical glitches would appear in the document name in the Pixelmator Pro toolbar. Fixed. Fixed several related issues with clicking Color and Gradient wells when the Colors window and Gradients palettes were open. Choosing the Merge Shape Components command on a shape with components that create a completely empty shape would cause Pixelmator Pro to quit unexpectedly. Fixed. Attempting to export a slice with a very long name would occasionally cause Pixelmator Pro to quit unexpectedly. Fixed. On very rare occasions, exporting an image for the web in the PNG format with reduced colors would cause Pixelmator Pro to quit unexpectedly. Fixed. The new Export for Web feature gives you a modern way to easily prepare your images for the web with export presets, Quick Export options, and advanced PNG compression. Get quick access to all your Pixelmator Pro tools with support for the MacBook Pro Touch Bar. Automatically perfect the colors of your photos with three machine learning-powered Auto Color Adjustments — Auto White Balance, Auto Lightness, and Auto Hue & Saturation. The new Slice tool lets you divide designs into individual images and optimize each one separately. Thanks to SVG support, you can now open, edit, and export resolution-independent vector images. Make selections of precise colors or entire color ranges. Advanced Compression lets you shrink image sizes to the smallest possible without losing quality. Export images in the modern High Efficiency Image File Format. See handy live previews when formatting text and adjusting layer blending. Use Select Color Range to make selections of precise colors or entire color ranges. Learn all about using Pixelmator Pro with easy to follow video and text tutorials on the new Tutorials page. The Pixelmator Pro Help menu has been improved and now shows search results from the online user guide. When moving guides, their position will now be shown in the current ruler units rather than pixels. Dragging a guide while holding the Shift key will now snap the guide to each ruler tick mark. You can now Control-click a ruler to change its unit. Layer style presets will now be outlined when selected. You can now show or hide each of the buttons in the Pixelmator Pro toolbar. The Gradient Fill layer style now has an Angle option. When using the Arrange tool, choosing the Reset preset will now reset the rotation of text, shape, and group layers as well as image layers. You can now change layer opacity using the number keys when using the Style tool. When you select a layer in the canvas, the Layers sidebar will scroll to reveal it. Pressing and holding the Command key will now let you move layers while using the Free Selection tool. It’s now easier to select other layers when having a layer selected within a layer group. In addition to Command-D, you can now press the Escape key to deselect a selection. The Pen tool now draws much more precisely, especially when using a Magic Mouse. The accuracy of the Quick Selection tool’s live overlay has been improved by 1 to 2 pixels. The quality of exported PDFs has been improved. The Photo Browser has been recoded to reduce loading times and prevent issues when Photos libraries would not load. Start Drawing and Close Path now appear as options when control-clicking a point while editing an open vector path. The Auto Contrast and Auto Color options of the Curves and Levels tools now work faster. Undoing an image size change would not restore layers to their previous positions. Fixed. Using the Command key to move a layer while using the Paint tool would cause graphical glitches. Fixed. When editing individual paths within a shape, the position of any gradient fills will no longer change. Layer thumbnails would not update when moving a selected image area. Fixed. When using any shape tool, the add shape cursor would not appear if an existing shape was selected even when it was possible to draw a new shape. Fixed. The Zoom button in the toolbar would not update after moving a Pixelmator Pro window between Retina and non-Retina displays. Fixed. Moving a selected image area within a group would move the group instead of the selected area. Fixed. It was not possible to move, select, or draw new shapes while editing the gradient fill of an existing shape. Fixed. It was not possible to change a layer’s rotation to below 0 degrees using the arrow buttons in the Arrange tool. Fixed. Pinching to zoom in or out while the mouse was over a scrollbar would not work. Fixed. Editing multiple times in a row using the Soften and Sharpen tools with different Strength settings would not work correctly. Fixed. The Soften tool would not soften enough when zoomed in to over 100%. It does now. On rare occasions, it would not be possible to edit certain areas of text layers. Fixed. The Reshape tools would not work on images over 4K with MacBook Pro models from 2016 and later. Fixed. Using the Paint tool with the Luminosity blending mode would produce random black pixels. Fixed. Layer masks in PSD files would sometimes be inverted. Fixed. Sometimes, it wouldn’t be possible to paint at the edges of very large selections (over 4000 pixels). Fixed. Text presets would be displayed incorrectly with large fonts and negative character spacing. Fixed. It was not possible to change the color of single text characters using the Type tool color picker. Fixed. Selecting multiple negatively spaced lines of text would create overlapped areas in the highlighted selection. Fixed. When filling an empty layer using the Color Fill tool with Sample All Layers turned on, edges would not be smoothed correctly. Fixed. On rare occasions, ungrouping a layer group and undoing would cause Pixelmator Pro to quit unexpectedly. Fixed. Undoing after painting would sometimes not be possible. Fixed. Refining a selection on a RAW layer would sometimes cause Pixelmator Pro to quit unexpectedly. Fixed. Zooming and undoing at the same time would sometimes cause Pixelmator Pro to quit unexpectedly. Fixed. Fixed an issue with using the Command key shortcut inside the Refine Selection tool that would sometimes cause Pixelmator Pro to quit unexpectedly. Switching to the Paint tool while painting a Gradient Fill would sometimes cause Pixelmator Pro to quit unexpectedly. Fixed. Added a few more fixes to improve the overall stability of Pixelmator Pro. The performance of the color adjustments has been improved — some adjustments should now be up to four times faster. Certain advanced Typography features, such as ligatures and alternate glyphs, were not fully supported. They are now. The histogram and sliders of the Colors adjustment are now more accurate — to check out the changes, hold down the Option key to extend the range of the Hue and Brightness sliders. Attempting to cut part of a shape, some text, or a layer group using the shortcut menu in the Layers sidebar would cause the image to be displayed incorrectly — cutting these layers is not possible, so this option is now dimmed. Shapes made up of multiple internal paths, such as certain letters converted into shapes, could not be made editable. Fixed. Fixed an issue that made it impossible to paint or erase straight lines by Shift-clicking. Layers duplicated by dragging while pressing and holding the Option key were not immediately snapping to other layers. Fixed. Undoing a color profile change in an image with color adjustments was not working correctly. Fixed. Pixelmator Pro would sometimes quit unexpectedly when deleting points from a path. Fixed. Pixelmator Pro 1.0.8 features a number of under-the-hood fixes that improve performance and stability. The inner workings of the selection tools have been redesigned, solving lots of issues that would make Pixelmator Pro stop responding. This update also includes a few other improvements, including Color Adjustment performance improvements, and several bug fixes. The Color Adjustments have been improved to work faster. You can now import color adjustment, effect, layer style, and text presets by dragging and dropping them onto the Pixelmator Pro icon in the Dock. The White Balance color picker can now easily balance colors in extremely over- and under-exposed images. Number grouping separators will now be ignored in all number fields instead of resetting values. EXIF data would be lost after saving to the Pixelmator Pro file format, then closing and reopening the image. Fixed. Image sizes in inches were displayed incorrectly in the Image Size dialog. Fixed. Reopening a Pixelmator Pro document would reset its PPI to 150. PPI will now be saved correctly with your Pixelmator Pro documents. The line height of text layers in imported PSD documents will now be preserved correctly. If the Pixelmator Pro tools were hidden, the brush settings shortcut menu for any brush-based tools would not appear when Control-clicking the canvas. Fixed. The Colors histogram would be shown with colors even if an image was fully desaturated using the Hue & Saturation adjustment. Fixed. Shapes would occasionally be drawn with no fills or strokes even if those styles were applied. Fixed. A whole bunch of fixes for a number of different issues that would make Pixelmator Pro quit unexpectedly. Everything should now be much more stable. Crop using your own custom ratios and save custom crop presets. This update also includes a number of performance improvements and bug fixes. The Type tool will now be highlighted when a text layer is selected. If no text is selected, clicking a text preset will now add a new text layer with the preset style applied. When using the Type tool’s Color Picker, pressing the Escape key will now close the Color Picker, as it should. Drag shapes from the Layers view to the Shapes palette to save them to your collection. The selection tools will now be highlighted if there is an active selection. A number of performance improvements make the selection tools faster and more reliable. You can now copy, cut, paste, and duplicate the components inside shapes. The Color Selection tool now works on layers with color adjustments. You can now hold down the Space bar to move selections while using the Rectangular and Elliptical selection tools. When exporting to JPEG, the more common .jpg extension will be used instead of .jpeg. The BMP and GIF formats have been added to the list of file formats you can export to. Pressing Command-I now toggles the Invert adjustment, instead of simply applying it. Dotted strokes now appear as they do in the original Pixelmator, improving compatibility with PXM files. Dragging and dropping RAW images into Pixelmator Pro now works faster. When changing image and canvas size, guides would be repositioned incorrectly. Fixed. Certain fonts with high baselines would be clipped to the boundaries of text boxes. Fixed. Fixed an issue that would sometimes make it impossible to change the font of certain text layers. Applying a gradient to the layer mask of a text layer would only work at the second attempt. Fixed. Copying a text layer and pasting it inside another text layer would include unnecessary text. Fixed. RAW layers imported via drag and drop would sometimes have incorrect layer handles. Fixed. Fixed an issue that would cause imported layers with transparent areas to be displayed incorrectly. When using the Paint tool in images with advanced color profiles, the colors in the Colors window would not match up with colors in the image. Fixed. Painting on an empty layer and moving a section of it would change the color of the painted areas. Fixed. The position of gradient fills would shift after converting text into a shape. Fixed. Trimming the canvas according to the color of the top left and bottom right pixels now works correctly. Undo steps would sometimes disappear when creating selections. Fixed. The Color Fill pop-up menu now correctly shows the selected blending mode. Occasionally, it would not be possible to save images if the Image fill effect was applied. Fixed. The fills of resized shapes will now be preserved more accurately. When using the Fill layer style on very small layers, the fill would sometimes disappear. Fixed. Several improvements fix flickering and positioning issues when editing shapes. The canvas would sometimes jump after resetting changes made with the Crop tool. Fixed. When exporting JPEG images without a specified color profile, one would be attached anyway. Fixed. If the preference for importing JPEG, PNG, and TIFF images w as disabled, images opened via File > New from Photos would cause Pixelmator Pro to stop responding when saving. Fixed. Combining effects like Affine and Op Tile would sometimes produce infinite images and cause Pixelmator Pro to stop responding. Fixed. A number of fixes improve the stability of various tools that use gradients. Pixelmator Pro would sometimes stop responding after moving the app from a Retina to a non-Retina display. Fixed. The speed of the painting tools has been improved — your first brushstroke should now be much faster. You can now export images to JPEG-2000 format. Fixes for several related issues that would cause Pixelmator Pro to occasionally stop responding. You can now import brushes from the original Pixelmator. When you drag and drop a layer to add it your image, it will now be added above your selected layer and not at the top of the layer stack. You can now use the Command-J and Command-Shift-J keyboard shortcuts to copy/cut and paste selections as layers. Merged layers will now be named after the top layer. The option in Pixelmator Pro preferences for importing images or opening in the native format is now much more descriptive. Fixed a number of cases that would make Pixelmator Pro stop responding when using the painting tools. Graphical artifacts would sometimes appear after repairing with the Repair tool. Fixed. When reverting to an earlier version of your image, the background color would sometimes be incorrect. Fixed. The colors of images exported to PSD would be incorrect when opened in Final Cut Pro X. Fixed. The horizontal edges of objects would snap to the grid incorrectly. Fixed. When flipping an object, its position will now be preserved more accurately. Various fixes improve dragging and dropping shapes and paths. Pixelmator Pro would sometimes stop responding when changing the color of a text layer. Fixed. Pixelmator Pro would sometimes stop responding when quickly switching to and from the Crop tool. Fixed. Pixelmator Pro would sometimes stop responding when resetting a selection. Fixed. Several related fixes make Pixelmator Pro less likely to quit unexpectedly. The update adds a few improvements and fixes a number different bugs. The last used Layers view will now be used for all new images. You can now press the Space bar to use the Hand tool while making selections with Free, Polygonal, and Magnetic Selection tools. The Unite, Subtract, Intersect, and Exclude buttons for editing vector shapes are now available when using the Arrange tool. Copy Style, Paste Style, Unite Shapes, Subtract Shapes, Intersect Shapes, and Merge Shape Components are now available in the Layers view shortcut menu. You can now press Command-Option-A to select all the layers in an image. The performance of the painting tools has been improved. Brushes like Varnish should now be much faster, more improvements are also coming. You can now undo guide movements. Several related fixes improve the reliability of cursors. Edit > Cut will now clear selected areas. Canvas Size will now work with negative values when Relative is selected. When exporting presets using the preset shortcut menu, only a single preset will be exported. The Color Fill tool color picker will now be canceled if you press the Escape key. Trim Canvas will now work correctly with masked layers. Document PPI will now be preserved when saving. Fixed an issue that caused Pixelmator Pro to stop responding when resizing the canvas with an active selection. The Grid will now be displayed correctly with all PPI settings. Hidden layers will no longer become visible when merging. The template chooser will now show template details by default. The Open Recent menu will no longer show nonexistent images. Your scanned images will now be imported once a scan has been completed. A range of additional stability fixes and improvements. This update improves the stability of Pixelmator Pro and addresses a few different crashing issues. Fixed an issue that prevented using units other than pixels when changing canvas size. Pressing the Command-A keyboard shortcut will now select text in text fields and dialogs if they are active, instead of the entire canvas. Pixelmator Pro would sometimes quit unexpectedly when removing a layer while editing effects applied to it. Fixed. Fixed an issue that caused Pixelmator Pro to quit unexpectedly when selecting brush presets. If the stroke layer style failed to appear when selected, Pixelmator Pro would sometimes quit unexpectedly. Fixed. Using the Color Fill tool on an empty layer with preserve transparency enabled would cause Pixelmator Pro to quit unexpectedly. Fixed. Fixed several related issues that would cause Pixelmator Pro to stop responding while painting. Fixed several issues that would cause Pixelmator Pro to quit unexpectedly while opening PSD files. Improved the overall stability of the Arrange tool. This update brings a number of fixes for issues with several painting tools as well as a number of crash fixes. When combining a large number of vector shapes, these would sometimes be merged incorrectly. Fixed. Layers would sometimes become blurry when flipping them vertically or horizontally after increasing their size. Fixed. Several fixes for painting on layer masks and undoing changes after editing layer masks. The colors of objects copied from images in one color space to images in another were managed incorrectly. Fixed. The Color Fill and Gradient Fill tools would not fill precise colors when an image was assigned a different color space. Fixed. Fill layer styles with transparent color stops were not being blended correctly with layers. Fixed. Pixelmator Pro would sometimes quit unexpectedly when applying gradients to an empty layer. Fixed. Moving a selection outside the canvas would sometimes cause Pixelmator Pro to quit expectedly. Fixed. Converting a text layer into pixels would sometimes cause Pixelmator Pro to quit unexpectedly. Fixed. Several fixes for exporting 16-bit PXD documents to PSD. When attempting to select a layer with an empty layer mask, the wrong layer would sometimes be selected. Fixed. Pixelmator Pro would sometimes quit unexpectedly when painting on a resized layer. Fixed. Several fixes for crashes when opening PSD files. Several fixes for crashes when editing text. This update adds multiple new languages — French, Italian, Spanish, Portuguese, Russian, Simplified Chinese, Traditional Chinese, and Korean. A range of performance improvements and bug fixes make Pixelmator Pro faster and more reliable. A range of performance improvements speeds up moving layers, zooming, and opening images. Opening images is now up to 6 times faster in some cases. The Colors histogram now displays colors based on the total size of objects rather than the amount of pure color. Color adjustment previews are now much sharper. Improved selection smoothing when copying and pasting selections. The Select Color tool is now much faster when zooming. The Magnetic Selection tool is now more precise. When using the Arrange tool with Auto Select turned off, you needed to drag inside a layer to move it. Now you can also drag outside the active layer to move it. You can now choose to export images with 8-bit or 16-bit color depth. When saving an image while applying color adjustments to an active selection, the adjustments would be discarded. Fixed. Selections with transparent areas would sometimes be shifted when copying and pasting. Fixed. Layers would sometimes move slightly when selecting them using the Arrange, Text, or Shape tools. Fixed. Completely masked layer areas will no longer be automatically selected if they’re not visible in the image. Using the Style and other tools, it was possible to select hidden layers by clicking in the image. Now, you should only be able to select them in the Layers view. Converting the bit depth of an image would not always work reliably. It does now. Changing the color profile of an image would sometimes not work. It does now. Undoing changes after resizing text layers would sometimes not work. Fixed. The Constrain Proportions option would sometimes be deselected for layers when saving a Pixelmator Pro document. Fixed. The compression option would be ignored when exporting 16-bit TIFF images. 16-bit TIFF images will now be compressed. Horizontal lines would sometimes appear on Mac computers with Radeon graphics cards. Fixed. When exporting to JPEG, there was an option to save with 16-bit color depth. JPEG does not support that, so that option has been removed. When exporting to PNG, it was possible to choose CMYK as the color profile. PNG files do not support CMYK profiles, so this has been removed. Pixelmator Pro would sometimes quit unexpectedly when closing documents. Fixed. When resetting all brush collections to default, these would sometimes not be updated in all files. Fixed. Many other improvements, including a number of crash fixes. A clean and refined interface simplifies image editing. Create and edit images nondestructively. Powerful color adjustments and full, native RAW support. An increadibly fluid painting experience and over hundred handcrafted brushes. Machine learning powers automatic layer naming, horizon detection, and more. Pixelmator Pro includes many more incredible tools and features.